I grew up in a small Suffolk village with three sisters and numerous rabbits. We used to make little dresses and outfits for our toys, which I must confess, the rabbits inevitably modelled. There was never a lot of money spare as there were a lot of us, so we were always encouraged to be creative and lead to me eventually going on to study Art and Design at college. Making things still makes me happy, whether I am sewing, crocheting, baking bread or making cakes…..I’m currently learning to knit and take the greatest delght in each and every stitch on my needles….I also make, possibly, the world’s best hazelnut and chocolate cookies. I live with my sweetheart whom I adore beyond words and a scruffy grey cat called Bernard. My hobbies include rummaging for haberdashery items at car-boots and charity shops, reading Jane Austen novels, watching Inspector Morse, drinking nice tea, poking our cat when he is sleeping and sniffing sheepy scented yarn. I have been banned from talking about Game of Thrones at home as I get too excited about it. I also like foraging in the local hedgerows, making jams and jellies with my harvest, eating blackberry crumble….. I have a secret crush on Susan Calman who I think is the funniest woman in the world. My favourite things are having a proper afternoon tea on a Sunday, riding my bicycle, walking in the autumn when it is all windy, watching snow fall and crocheting blankets that my cat then steals. I have a folksy shop where I sell hand made items I have sewn from a mix of vintage and contemporary fabrics and notions. I’m more than happy to make commissions using fabrics that have meaning and history to you, so please feel free to contact me via my website for more information. Absolutely love your work!! I happen to love your latest. Gift to your sister!! Thank you, I’m hoping to make some more as Christmas gifts though I’m not sure if they will be hexagons, I was thinking of Dresden Plates. Erica, I have just read your latest post about your love of hand quilting, and couldn’t agree more. Your work is lovely, and so Bernard. Hi, thanks for stopping by. I have tried machine quiting but it’s really not for me….I know I’ll never have time to make dozens of quilts but I’m fine with that. He really is the apple of our eyes and when he was poorly at Christmas (he was diagnosed with Cancer) we were so distraught…but he’s doing okay and we’re just taking it one day at a time…he’s getting very spoilt and has even been allowed to nap on my yellow shawl. HI Lori, yep I’m there as ericka eckles…..where Bernard has his own little board. I would like to say thank you for the ‘how to’ of making a baptist fan template. So easy, so obvious, well once you showed me how ! Thank you , thank you. I am another slow quilter doing the whole thing by hand and actually I don’t find it all that slow either. I have tried to fan quilt before and failed miserably until i found your pattern, brilliant ! by some miracle I had all needed to make the template in the house and so i did it this morning and began quilting just now. I also love your blog and intend following you from now on, your photos are lovely. I have no blog but have recently begun on instagram , my name on there is susiestitch1. 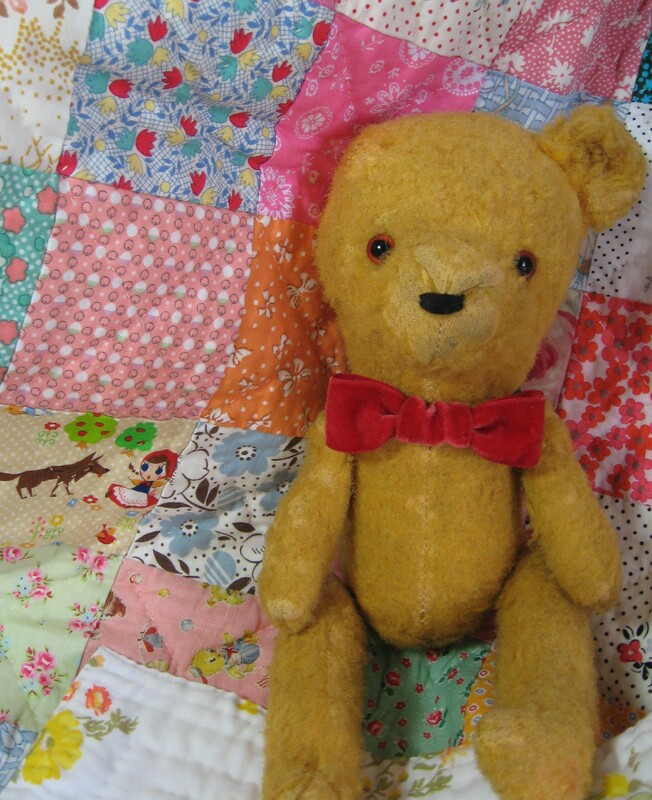 Yay, I’m so glad that the tutorial helped…I love hand quilting and baptist fan is my favourite happy go to pattern. I only quilt with the baptist fan as it was my husband’s grandmother’s way of quilting in the 1930’s. I still have one box of a quilt that she had given to her daughter (my husband’s mother) and when she died, I got it. It has not been quilted yet, it still is as squares and she had drawn the design with a pencil on the top. The thing that I want to share with you is a video of a lady who made quilts in the 1970’s. It is called ‘A masterpiece of a Lone Star quilt’ and the quiltmaker was Kathleen Ware; she died in 2001. She did not have all these fancy tools to make her quilts, just a plain sewing machine, needles and threads, scissors etc. It is still on Youtube… an inspiring lady who did things with her heart. Love your work. Thank you so much for sharing your story, the quilt pieces must be really special, are you planning to quilt your husband’s grandmother’s patchwork? Thank you also for mentioning Kathleen Ware, I didn’t know about the video but will have a look at it later on today. Yes, about my husband’s grandmother’s quilt, I do plan to quilt it but first, I have to replace the pieces in the right order, and to do that, I will need one bed in my house where I can place the squares and match the pencil fan design in their right position. Eventually, it will get done. Enjoy the video; I rewatch it when I get the nostalgic blues and it makes me feel good. I’m not sure where you live Louise but it might be if there is a quilt shop local to you they will have a design board wall where they might let you lay the patchwork pieces out on….if not, try pinning up a sheet to a bedroom wall and then you pin the patchwork blocks to that, it’s much easier to see what you are doing as you can step back rather than lay things out on the carpet. I live in a Montreal, Québec, suburban area, and unfortunately, there is no local quilting shop here, I get my things via internet but I do a lot of recycling so, the local community center where we can buy fabrics $3/bag is fine with me. About the quilt squares, thank you for the very good suggestion; as for myself, I was thinking about scanning each square and then playing with them in my graphic software. It would be like a puzzle. There are 40 squares total. It should be easy. I have a Grandmother’s Flower Garden hexagon quilt top finished and ready to be quilted anyway right now so I should have a bit of time to play the puzzle early in the morning, drinking my first coffee. The autumn is coming soon and here too, the nights are becoming cooler. Ahh, see I’m not very technical and wouldn’t even of thought about being able to do such thngs on the computer…bet it looks fabtastic when it’s all finished. I’ve got a whole load of dresden plates I need to applique onto fabric for a quilt top and also have hexagons cut out and tacked over papers for a quilt though I think I’ve made them too big so may well un-pick them and cut them into smaller diamonds…sometimes I do despair at my crazy ideas but I know if I sew them and they aren’t right I’ll never be happy….